Hi, hope you are all enjoying the Online Extravaganza! 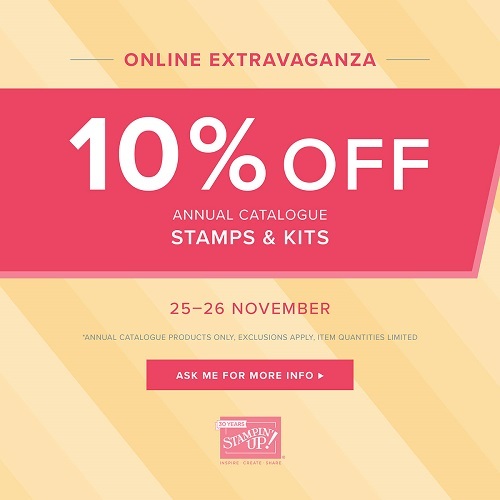 It continues today with 10% off Stamps & Kits. Hi, this is the time of year you have been waiting for – the time to catch some super bargains on all of your favourite products. I hope you are ready to save big because we are about to enjoy a spectacular six-day promotion with exclusive, limited-time deals. Get ready for Online Extravaganza! Online Extravaganza will run for six days. 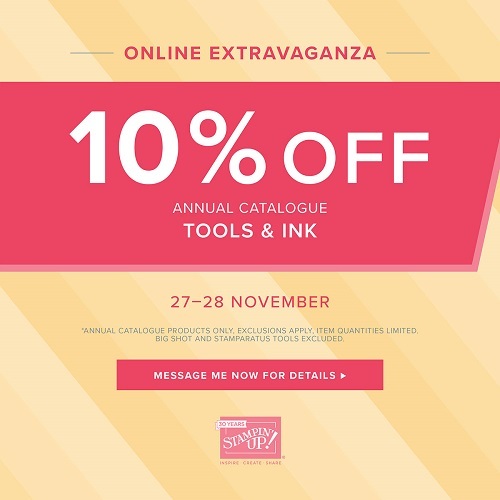 During this time, there will be three, 48-hour sales featuring a selection of products from the 2018–2019 annual catalogue—all at 10% off! Each 48-hour sale will feature two product categories (e.g., paper, stamps, ink, etc.). When one sale ends, the next sale begins; this cycle will continue until Online Extravaganza is over. By the end, nearly every item from the annual catalogue will have been on sale! To see the full selection of discounted items during each 48-hour sale, please visit my online store. Each sale will be given its own category, which will contain all available discounted items for that particular 48-hour sale. After that, the only thing left to do is shop! 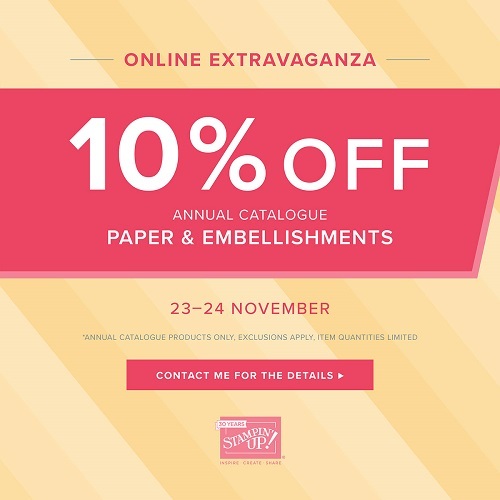 Online Extravaganza kicks off today with 10% off Paper & Embellishments. Isn’t this fantastic! Hope you enjoy shopping during the Online Extravaganza! Put on your party hats, and get ready to save. 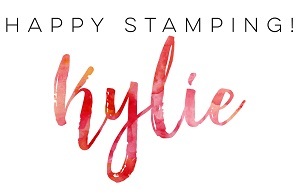 It’s time for It’s Our Birthday Stamp Sale! For 24 HOURS ONLY, you can save 15% on select stamp sets. Woooohoooo! Hi everyone, in honour of World Cardmaking Day on October 6, Stampin’ Up! has a great promotion for some of our fabulous products, and some of our great staples too. These items are on sale in my online store until October 7, 2018. Hi, so I thought the July Joining Bonus was so fabulous that I forgot to share the other great offer which is available during the month of July! If you love Designer Series Paper then this is the sale for you! Buy any three of the following Designer Series Paper packs and get one free. I love these papers. They are so pretty. I cannot wait to start creating with them too. 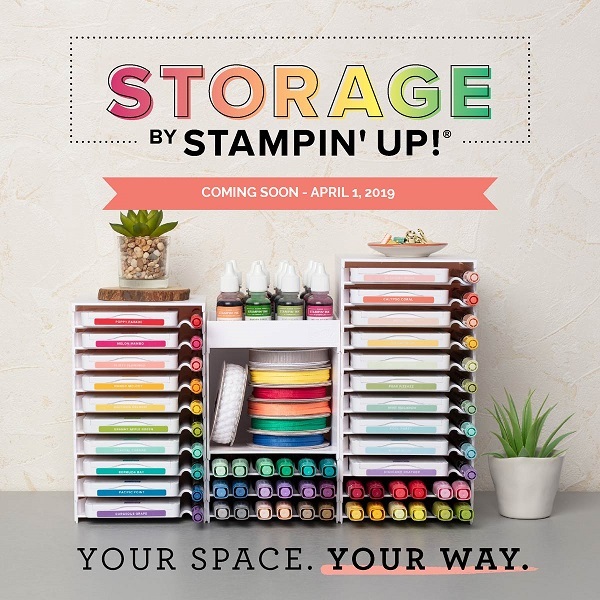 I still have a couple more weeks before I will be able to start crafting again and I CANNOT wait!! I think this is the longest I have gone without creating in many, many years! Thanks for your patience! I hope to be sharing ideas again very soon. Hi, there are additional discounts to be found on selected items on the Retiring List! Yay! There is still time to pick up some of your favourite items from the 2017-2018 Annual Catalogue and the Occasions Catalogue but remember many items are retiring and won’t be around after May 31st, 2018. All the retiring items can be found here.